This was a Japan PC port of a lawyer adventure originally a 2004 GBA Japanese game. It first was done in English as an enhanced version on the Nintendo DS later in 2007. 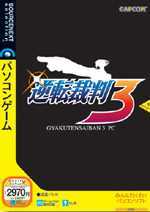 This third time around, the gameplay still follows that of the previous two games, featuring Ryuuichi Naruhodou's third year as a lawyer. The player has to find/examine evidences, press witnesses, and find the true murderers in order to prove the innocence of his defendant. There are 5 cases in total. In some cases, the player does not control Ryuuichi, but rather some other characters for the courtroom battles. The story is also more intact than the previous games, and it also features a whole new cast of interesting characters. In 2019, an English version was included in Phoenix Wright: Ace Attorney Trilogy.